My recent work with Kinetic Fin has really turned me around on the whole DSLR for video thing, especially the Canon models. The first two shoots I did with them, I saw the 5D, tweaked and tinkered with it and lit for it as the A cam, but ultimately the camera was confined to sticks or operated by the director (while I operated C cam - my trusty DVX). I knew that the cam was getting really good results, but the experience was far from hands-on. However, on the Gevalia shoot two weeks ago and another one yesterday for parent company, Kraft, I actually got the chance to operate a 5D in a doc setting. This was something I had many reservations about - mainly form-factor and stability. I had seen videos online of handheld DSLR video and it's not too great on it's own. The shape and size just do not allow for smooth handheld work and stuff gets jittery very easily. So, knowing about this issue, I brought my Tiffen Steadystick aboard both of these recent DSLR shoots. (Just as a side note, I picked up that contraption so that I could operate hanheld cameras like the DVX and others in a way similar to shoulder-mount cameras.) The stability it affords is fantastic. And based on my recent experiences, it really helps DSLR shooting. I was able to get really nice handheld stuff on the 5D and I am told by Kinetic Fin editor and shooter extraordinaire, Gene, that the footage from the 5D I operated was smooth, stable, and looked great. With the setup I used, I was able to operate in a very familiar way and get really great results. So that's that. DSLR video can be really great. And especially for Kinetic Fin's very intimate and honest style of filmmaking, shooting with a DSLR is the perfect combination of small, unobtrusive form and unbelievable cinematic quality. As there appears to be a lot more work with them in the very near future, and since I now know I can operate the way I like to, I will be investing in a DSLR for video very soon. Until then, though, here's a pic from the Gevalia 5D shoot. You can tell even in just a picture of the screen of the cam, it takes some great video. (And yes, those are my hands on there). In my last post, I referred to myself as format-agnostic when discussing the choice of camera for one of the projects I'm currently working on. For a variety of reasons, lately, I've been thinking a lot about the multitude of cameras and video formats and film stocks available for motion-picture production. As a note I enjoy shooting both film and video, though the breadth of my recent work has been exclusively some form or another of digital capture. I am not, however, pro-digital. So what is "the right format?" I think every filmmaker has an idea of what is the best format for their project. To some it's just whatever is the best quality, highest definition they can afford. To others, it's what looks the most appropriate - a gritty, grainy stock for a post-apocalyptic drama? Maybe a slick, clean, noise-free format for a romantic comedy? All these requirements they have are certainly valid, but ultimately for me, the right format is neither of the above. If I'm hired to shoot a project, I am responsible for delivering the image. If the production has no money and I insist on shooting 35mm and we run out of money before we're done, I've failed in my job. If the production blows their money on a RED package I wanted and then skimps on lighting, production design and other stuff that goes in front of the lens, all I'll be able to deliver is high definition crap. See, there are so many more important look-related elements than just the format we shoot on. With right stuff in front of the camera, it almost doesn't matter what's inside. Good lighting, good composition, good production design, and good talent can help even the cheapest camera look great. That's not to say that a Flip cam is the next wave of filmmaking gear. But if there's a story to tell and the talent is all there, maybe a handycam could work if that's all the filmmakers can afford. That said, there is one basic requirement I do have for the format I work with; control - the camera must not be Full AUTO. I must be able to control iris, focus, shutter speed (at least to lock one down) and whitebalance. With that, anything can deliver a good look for your film. Panasonic DVX100 (mini DV, 480/24p). Webisodes, feature documentary, TV segment. Sony EX1 (XDCam EX, 1080/24p). Feature documentary, TV segment. Sony Z1U (HDV, 1080/24f). TV segment. Canon 5D MkII (1080/30p). TV spot, webisodes. Panasonic HMC150 (AVC-HD, 1080/24p). Feature film. Panasonic HVX200 (DVCPro HD, 720/24p). TV spot. Sony V1U (HDV, 1080/24p). Webisodes. Panasonic HDX900 (DVCPro HD, 1080/24p). TV segment, feature documentary. Samsung Piece-of-Crap-Quicktime-Camcorder. Viral video for the web. Again, as a final note, I must reiterate that every format needs good lighting and appropriate visual design like sets, costumes and such. A cheap handycam with no (or bad) lighting will look terrible. But the same thing goes with a pro HD cam. But that very same handycam shooting a well lit scene and exposed right can look really nice - and if that handycam is the only thing you have that will shoot your story, it's the "right" format for you. So in my last post I mentioned something on the horizon that would be very exciting. That something was a trip to Sweden for the Gevalia work. Well, unfortunately, that trip fell through about a month ago. It's still happening but for a variety of reasons, the director has to now do it on his own. So I was a little bummed for a bit. Then, less than a month after Sweden went away, I got an opportunity to go to Budapest, Hungary for a shoot with a different client. I was reminded of the "even steven" episode of Seinfeld - it all tends to work itself out. So Budapest was last week and it was cool. It was a very brief stay, arriving Wednesday afternoon and leaving for home very early Saturday morning. Thursday and Friday were shoot days and we did a lot of shooting. It was an industrial for an ad agency, Wunderman, involving one of their big clients, Nokia. Same sort of idea as my Texas trip last November. Anyway, all in all, it went well but it was definitely an eye opener. Early Thursday, about 40 minutes before we were due to roll, some of the producer's gear began acting up - a wireless mic that was do be on a key player in this shoot. Needless to say, this was a serious problem. Luckily, we had a great P.A. on board (a local) and within minutes, she was on the phone to a rental house arranging to rent a replacement wireless system. By the end of her conversation, we figured out the problem with the producer's gear and the P.A. arranged to have a replacement part also sent over. Within 20 minutes, the gear was there and we were rolling. The next day, we were presented with another issue - as it turned out, there would be two key players in that day's shoot (which was not the original plan). Luckily our system was working again and we had the rental on hand so yet again, things worked themselves out. Had we not had the unexpected and somewhat stressful mic failure occurred the day before, we wouldn't have had the second wireless system. All in all, it was nice. With the work schedule, I didn't get to do much touristy stuff but I had some fantastic local food every day, saw a great gypsy band and stayed in a very nice, historic hotel (the Hotel Gellart). Anyway, the weekend before Budapest, shooting commenced on a feature film I'm working on, "Director's Cut." It's a low-budget film with a rather small crew and the weekend was a great icebreaker. My frequent cohort, Bret Scheinfeld, is aboard as sound mixer and I've got a pretty nice support crew. Marcus, my gaffer, is cool, and I've got a couple of G&E-dedicated P.A.s that are really into it and very quick learners. I think the Spring shoot will go pretty smoothly. So the most important rule we've got to follow for this shoot is the K.I.S.S. principal ("keep it simple, stupid"). There's just so much to get done on such a short schedule, so the setups need to be versatile and quick to change. So we're lighting things in broader strokes and keeping things relatively high key. It's a comedy, anyway, and the director definitely wants a brighter feeling for most of the film. Below is a still from one of our scenes. A 4bank fluorescent for the key and a large diffused window for fill and ambiance. Behind the actor, a small HMI for edge. We're shooting on the director's camera, a Panasonic HMC150. It's a prosumer model that shoots 1080/24p video to SDHC cards. If time and money allowed, I'd shoot 35mm for this - or at the very least Super16 or RED. But the budget is what it is and the schedule is tight so the best format available to us is what we've got so that's that. 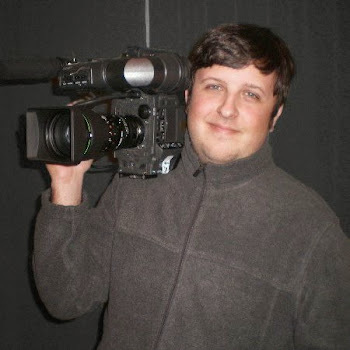 Besides, I'm a pretty format-agnostic cameraman. I really believe that with the right lighting, composition and settings (including digital tweaks and optical filtration), you can make great images no matter the format. Coming up later this week is another shoot for Gevalia with director, Bradley Farrell (again with Bret on board for sound). It's a tasting party for a new blend and apparently there will be some "celebrities" there. 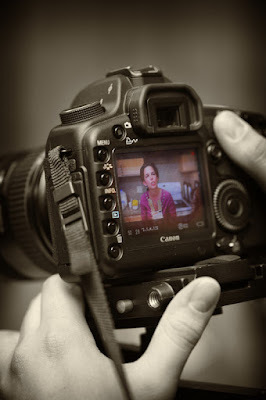 3 camera shoot at Gevalia's corporate kitchen with a Canon 5D and two HVX200. With the amount of coverage and the fact that at any one time a camera could be shooting in any direction, the lighting approach has to be pretty simple (and of course, good). The available light is pretty nice there - high ceilings with warm fluorescents for an overall base level. Accent lights under the cabinets and these small frosted pendant lights positioned over the granite islands. I'm thinking I'm going to fly a couple of 250w fresnels (flooded) crossing as back/edge lights (they'll be attached to the drop ceiling). I'm hoping that'll be enough but I'm prepared to bounce something into the ceiling from the front of the space if necessary. So that's all for now. Pictures from Gevalia to come.